We dropped into the library this afternoon to pick up a book that dh had on reserve so I decided to look around at the 14 day books. 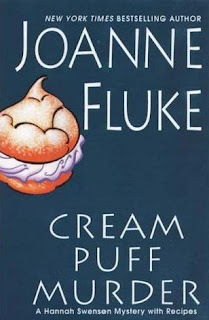 The first look around I did not find anything but then a light bulb went off in my head and I went over to the computer to search for Cream Puff Murder by Joanne Fluke, I knew her new book was out. I figured that the book would be out so I checked on the large type and that was out but the regular type book was in! I hot tailed it over to the shelf and found the book! If you have never read her books they are fun and full of wonderful baking recipes. Basically, Hannah (main character) runs a cookie store, has two men in love with her and want to marry her, and she seems to be forever discovering dead bodies. You learn about her family, and have some good chuckles along the way through each book. I will be curling up over the weekend and diving into the book.